Once upon a time, parents taught children right from wrong. Then one day someone came up with this ridiculous idea that absolutes don’t exist and right and wrong are totally subjective. That was just the beginning. The day of parents training their children seems to have dissipated. Parents, at best, have legislated morality to the church and blame the church if something goes wrong with their children. To some degree, they legislate to the school system. You can’t even legislate morality to Christian schools. I’ve seen more rebellion come out of Christian schools than I have public schools (I graduated from a Christian school, and I must say that most people no longer hold to the principles taught in our school). Have we forgotten that the home is the foundation for society? God instituted the family first, then government, then church. You can argue that if you will, but follow the Old Testament. Parents must train children. We can’t expect our teachers and preachers to make our babies good boys and girls. A sad illustration came from a pastor I know. He had a young man in the church who moved away and embraced a sinful lifestyle. Another pastor called the first pastor, telling him that the parents were just blown away. The second pastor had no chance of reaching this young man because the parents went home and tore the pastor apart. This young man saw the hypocrisy and didn’t want it. Moms and Dads, we must lead by example. This “do as I say not as I do” junk doesn’t cut it. We must get out of our narcissistic little world and invest the right things in our children before it’s too late. They may not be perfect, but they will at least be able to distinguish right from wrong. 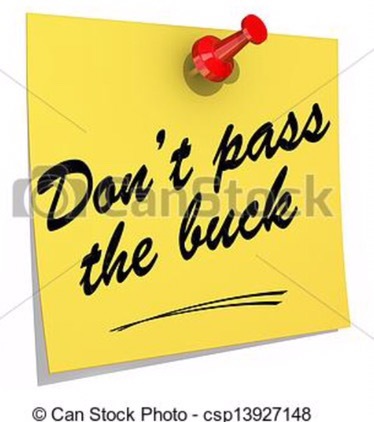 Don’t pass the buck! Carry the torch!